We are 1/2 mile west of the Foley Beach Express. We are a factory-authorized warranty center for Hatteras Yachts, and our factory-trained technicians operate from stocked service trucks for the most immediate and complete response to any issue and ease of any installation. Our customer focused approach means seeking out the best products and solutions for each individual project and working until the customer is completely satisfied with the end result. But most of all, we have a true passion for what we do. 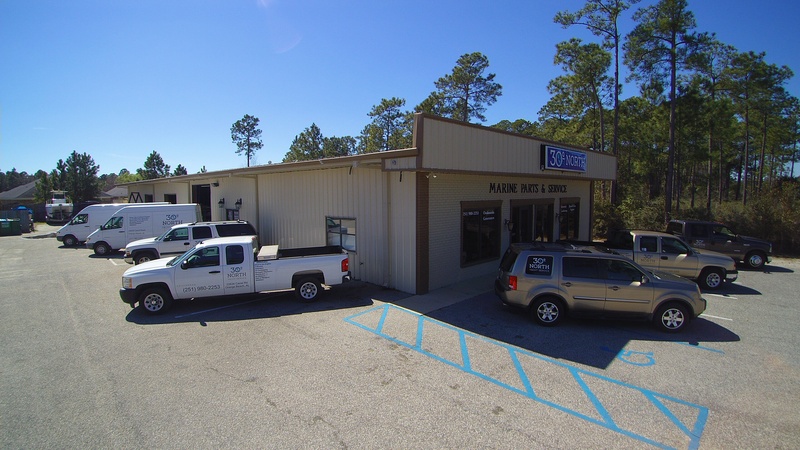 Owner Eric Jung has 40 years of marine experience and a Bachelor of Science in Mechanical Engineering. He and his wife are avid boaters and live full time on a 72’ cockpit motor yacht. Our dedication extends to everything we do in business. We treat everyone on staff like family, and our customers become a part of that family, too. At Thirty Degrees North, LLC, our mission is to deliver an exceptional boating experience that exceeds your expectations and improves your quality of life on the water. We will provide the highest quality boating products, services, and value. We will serve you, our customers, with our extensive professional knowledge and experience while seeking to establish genuine, lasting relationships. At the core of providing great service to customers is our mission to provide an excellent employment environment that promotes teamwork, support, and leadership while providing the resources and tools required for optimal personal and professional development.